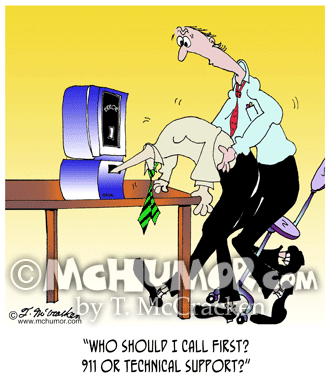 Computer Cartoon 6990: Looking at someone whose head has been sucked into a computer another asks, "Whom should I call first? 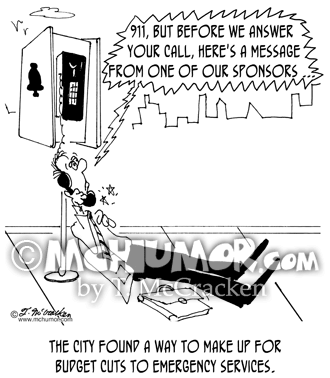 911 or Technical Support?" 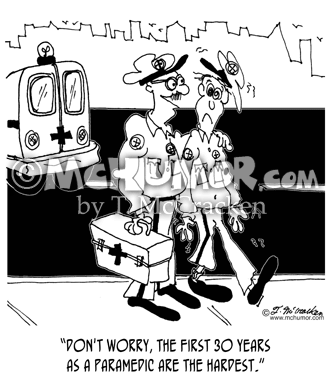 Paramedic Cartoon 7006: An old paramedic saying to a young frazzled one, "Don't worry, the first 30 years as a paramedic are the hardest." 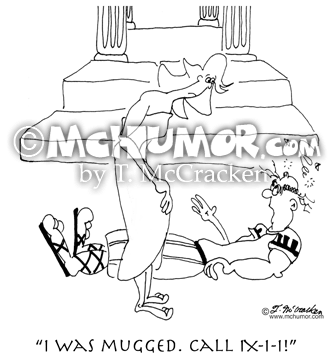 Paramedic Cartoon 6992: An injured ancient Roman yelling, "I was mugged. 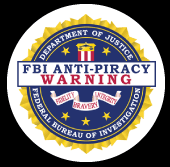 Call IX-I-I!" 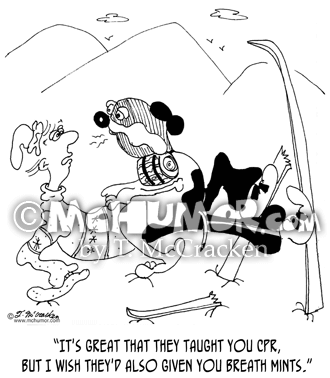 Paramedic Cartoon 7055: "The city found a way to make up for budget cuts to emergency services." 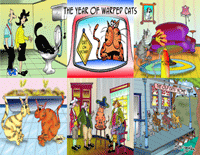 A man at a pay phone having a heart attack hears a voice say, "911, but before we answer your call, here's a message from one of our sponsors ... "
Emergency Cartoon 6467: "Life in the Fast Lane." 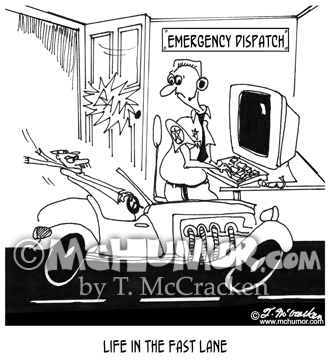 A car drives right through an "Emergency Dispatch" office. 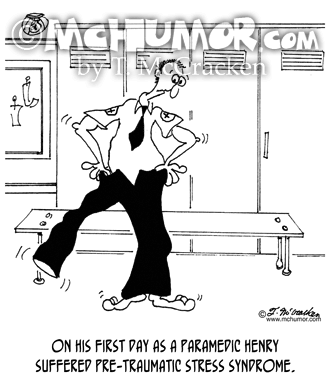 Paramedic Cartoon 9213: "On his first day as a paramedic Henry suffered Pre-Traumatic Stress Syndrome." 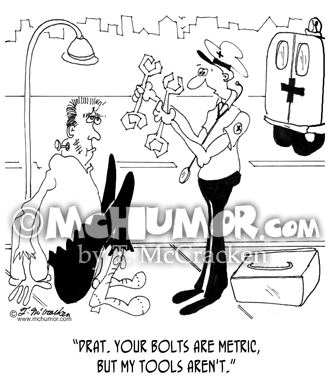 A nervous man puts both legs into one pant leg. 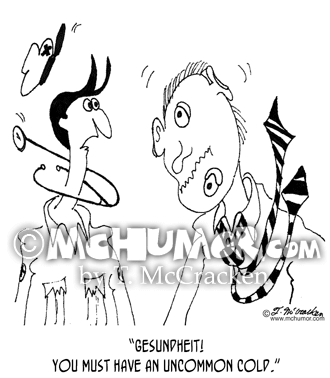 Paramedic Cartoon 6951: A paramedic saying to a fellow sneezing and completely rearranging his face, "Gesundheit! You must have an uncommon cold." 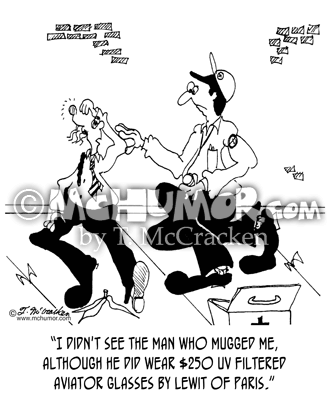 Fashion Cartoon 4346: Someone who's been mugged saying to a paramedic, “I didn't see the man who mugged me, although he did wear $250 UV filtered aviator glasses by LeWit of Paris."